One hundred miles round to Wales the old fashioned way, then through the Forest of Dean following some of the best roads in the South West. 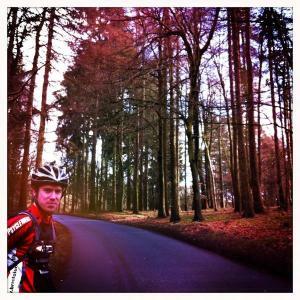 The Forest of Dean feels like a world away from the local riding around Bristol. The hills are meaner, the roads are quieter and the grass is proverbially greener. There are three great parts to this ride, the first being the route out through Berkeley which follows some particularly picturesque roads that run flat alongside corn fields and grassy fields and sunflower fields. After passing briefly through the Gloucester ring road - taking note to never live there, there's a fast section of main road that shoots you down into Wales. A sharp hill off to the right takes you away from the traffic and, quite shortly, into the ghostly silence of the Forest of Dean. Wind your way around the woodland and then you eventually find yourself on the B2422 heading into Chepstow. This is a fast and undulating section, mainly downhill. Heading through Chepstow and over the Severn into England the third favourite section is the good old return to Bristol along the flats of the estuary. However many times you've ridden it - it's always a treat. This is a great time to bonk or run out of water!